This was one fun couple…she with her dry, casual humour, enthusiastic to chat, and he, reticent, allowing her to do all the talking with his eyes so honest & very much in love with her. 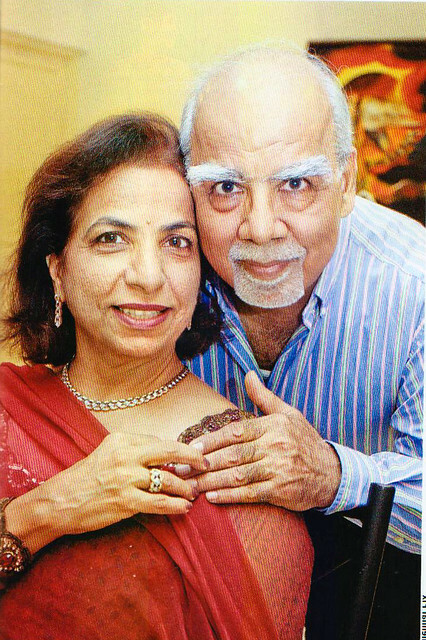 Jaya (56) & Narain Mahbubani (63) – a Sindhi couple from Hong Kong who have made Chennai their home since the last 12 years. THEIR’S IS A LOVE THAT GROWS & MATURES WITH THE YEARS. We spent the afternoon in their tasteful, smart home over lots of laughter, a few lumps in the throat and some delicious mixed nuts & thoughts to chew upon with this IDEAL couple. J&P: Tell us a little about your origins. She: Both our ancestors are Sindhis from Pakistan who had to migrate to India during partition. We were married in 1982 and we have three wonderful children, Viniti, Urvanshi & Jalesh. J&P: …and thus the world becomes our oyster. Tell us how you met. She: I was 26 yrs old when we met. My uncle brought him home one day with the sole purpose of match making. I was working with the German consulate in Mumbai. She: But when he left, we didn’t hear anything from him for months! He: (looks shyly at her and asks) – Isn’t that when the noose happened? She: (laughs) After almost 3 months, he turned up at my home in Mumbai. He was based in Hong Kong then. We chatted for a while, and then it was time for him to leave, so my parents drove him to the airport. I sat in the backseat of the car with him. All of a sudden he took off the gold chain from his neck & put it around mine. I suppose we were engaged at that moment in time. I call it the noose! J&P: And what did the parents say? She: Narain’s own parents had already passed away at that time. He warmly adopted mine as his own. She: That he was a self made man. I was impressed! I’ve never said this to you in 29 yrs! (She exclaims fondly). He: I was drawn to her because of her education. She has a bachelor’s degree in German and 2 masters – in linguistics and in guidance & counseling. I also had an intuitive impulse that she’d help me in my business. She: He was a workaholic and used to travel a lot. I enjoyed keeping home & bringing up the children. J&P: We notice that you have your own work spaces in your beautiful home. He: I used to run an import-export business, but have now retired. I have some properties in and around Chennai which I invested in while in Hong Kong so it keeps me busy trying to cash in now. She: I am back to doing what I love – back to German. We have been in Chennai for 12 years now. We travel a lot to meet our children and my parents and have lots to look forward to yet! He: I love to listen to music, read news, and enjoy my ‘self’ time. J&P: Are you very different from each other? She: (laughs) Which couple doesn’t have differences? But fortunately, we enjoy many similar activities. In our early years in Chennai we loved going for movies and for concerts during the Margazhi festival of dance & music. When ‘The Park’ hotel launched here, we loved going there – it was our ‘adda’. He: I’m too used to her ways! If she’s happy then that’s best. I love her caring nature towards others. She: I won’t be as humble as him. I wish he wouldn’t procrastinate so much. Earlier he was very hard working, now he’s too chilled out – but I guess he deserves it! I’m very happy that he takes a lot of care of my family…my parents, my sisters – they are all HIS and he loves them truly. It’s the greatest blessing in my life. J&P: Do you enjoy similar cuisines? She: We have the same taste in food – both of us like variety. So a normal day in our lives would include South Indian breakfast, Roti, daal, subzi for lunch and an international dish for dinner like a pasta or bake. He: I’m not fussy about what comes on the table. I give thanks & eat. She: My standard question every single day is “what would you like to eat” & his standard answer is “whatever you like to cook”. And I love his answer. I wouldn’t have it any other way! He: When the kids were young, and still living with us, we used to take them out on Sundays for lunch…more for a change and to give her a weekly rest. Now we prefer more of home cooked food which is any day healthier than eating out. She: I do my cooking myself. When he used to travel he used to love returning home to my cooking. He: We are vegetarians by choice. We were not earlier. She turned vegetarian after she joined the Brahmakumaris in 1989. She: I was willing to cook non-veg for them, but they all gradually stopped. In fact, our son, Jalesh has a ‘go veg’ tattoo on his arm! J&P: And how did that happen? He: That same evening Jalesh had a birthday party at McDonalds. He came back hungry from the party, because everything was non-veg there. He was so sensitive even at that tender age! And still is. When we went on a cruise in 2008, he insisted that I undertake from the cruise line that even their cheese and pastas do not contain any non-vegetarian ingredients. He: When he prostrated at my feet for my blessings, after his sacred thread ceremony in 1997, I was so touched, that I also gave up non-vegetarian food that very moment. J&P: Narainji, do you like to cook? He: No! I make a good cup of tea! She: After 29 yrs of marriage I get bed tea some time. J&P: Together you have made a beautiful family. Please share a tip for youngsters on love, marriage & commitment? She: Both have to be committed to each other & the marriage. A perfect marriage would be where each partner brings out the best in the other. They must nurture each other as individuals. He: In today’s fast paced world, it is better to know each other well before committing to marriage because work life, pace of life, everything has changed. There should be no harsh surprises later. Share & care is my motto. I also believe that it is nice to live with elders…youngsters must try to do that. First published in December 2011 in Harmony – Celebrate Age Magazine for the column – Soul Food and Soul Mates. Part-2 of this post is the healthy vegetable medley of Saibhaji from the kitchen of Jaya & Narain Mahbubani – the 6th couple featured in this column.